This year is the 40th anniversary of the release of Monty Python’s Life of Brian. The film met with instant controversy in 1979 and was banned in Ireland, Norway and parts of Britain. In the US, protesters gathered outside cinemas where it aired. 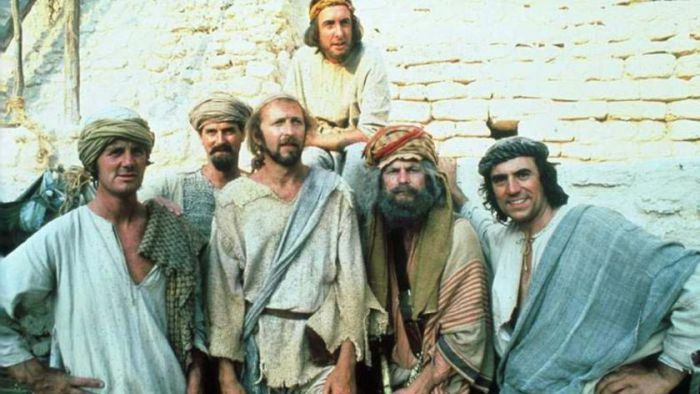 Life of Brian tells the story of Brian of Nazareth (played by Graham Chapman), who is born on the same day as Jesus of Nazareth. After joining a Jewish, anti-Roman terrorist group, The People’s Front of Judea, he is mistaken for a prophet and becomes an unwilling Messiah. All this eventually produces the film’s most remembered line, courtesy of Brian’s mother Mandy (Terry Jones). But is it still funny? In November 1979, the BBC famously televised a debate between Pythons John Cleese and Michael Palin and two pillars of the Christian establishment, journalist Malcolm Muggeridge and then Bishop of Southwark Mervyn Stockwood. Each side totally failed to understand the other. Muggeridge’s point was that Brian was nothing but a “lampooning of Christ”. The Pythons argued this couldn’t be so because Brian was not Jesus. Technically, they were right. Still, this did not satisfy the Bishop, or the film’s many critics. How does Life of Brian — which is being re-released to mark the anniversary — stand the test of time? Watching it today, it strikes me that, as parody goes, it is a pretty gentle, even, respectful sort. Ironically, to be properly offended by it or even to get the joke — then or now — requires a good knowledge of the life of Jesus in the New Testament Gospels. What of the Church’s complaint that Brian was Jesus and thus the film was sacrilegious or even blasphemous? There are three places in it where Brian and Jesus are clearly distinguished. Firstly, when the wise men — having worshipped the wrong baby — realise their mistake, they return to the stable to retrieve their gifts. Secondly, Brian is seen in the crowd listening to Jesus deliver the Sermon on the Mount. And in another scene, an ex-leper (Palin) complains to Brian about the loss of his livelihood as a beggar because Jesus has cured him. Still, Brian is in some sense, “Jesus”. For the film relies on both the similarities and differences between the lives of both men. They are both born in stables. They both meet their deaths through crucifixion, although the one ends in Jesus’s resurrection from the dead and the other in Eric Idle’s nihilistic song Always Look on the Bright Side of Life. (“For Life is quite absurd, and Death’s the final word.”) The Pythons also make the point that there were many others like Jesus at the time (such as Palin’s really boring prophet) proclaiming the end of the world was at hand. Life of Brian was certainly considered blasphemous in 1979 — and the film itself makes references to the absurdity of blasphemy as a crime. Today, however, blasphemy is no longer on the cultural agenda of the non-Muslim West. Christians and others look disapprovingly on Islam’s understanding of blasphemy and the severe punishments meted out for it. As a crime, it has been religiously “othered”. In this assertion of the freedom of the individual, of the virtue of thinking for yourselves, the film exemplifies modernity. Philip Almond is Emeritus Professor in the History of Religious Thought at the University of Queensland. This article first appeared on The Conversation.